Established in 2012 , After School have introduced multiple educational products like Spoken English, Handwriting, Calligraphy, Brain Gym, Mid Brain Activisation. Abacus under the banner After School. Abacus Little Master is on the verge to be one of the most successful and reliable mathematical educational program to help people of all ages. We have trained over 1000 students. The founder members have over 20 years of experience in education and franchise business model. Abacus Little Master's activities are focused on improving educational and mathematical knowledge and concentration for all age groups using modern unconventional method. It is not just supplying the products & services; it is about developing and understanding needs of every single student who have committed with us. It is difficult to imagine counting without numbers, but there was a time when written numbers did not exist. The earliest counting device was the human hand and its fingers. Then, as larger quantities (larger than ten human-fingers could represent) were counted, various natural items like pebbles and twigs were used to help count. Merchants in those days not only needed a way to count goods they bought and sold, but also to calculate its costs. Until numbers were invented, counting devices were used to make everyday calculations. 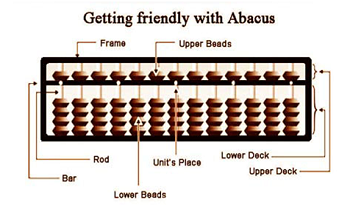 The abacus is one of many counting devices invented to help count large numbers. 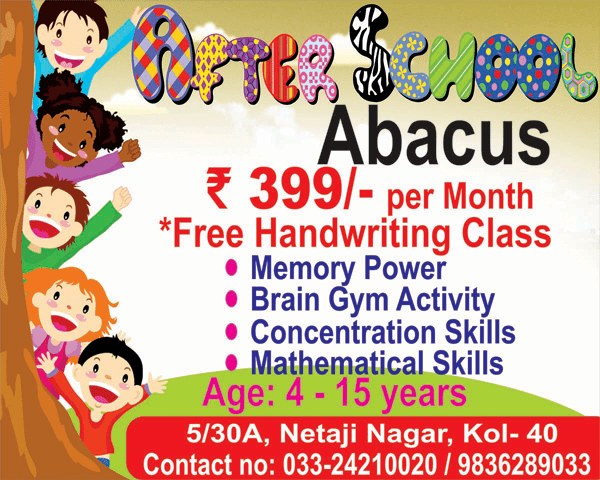 Abacus Little Master, provides a start up education to make learning interesting, lively and full of fun. It develops children concentration, thinking, observance, reading and writing abilities. 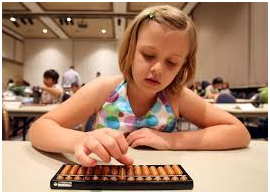 At Abacus Little Master, we use Soroban Abacus as a tool for development of Child's Brain. We introduce different ways of mental calculations that develops numerous abilities and ultimately helps in development of Right Brain. This is the only program which teaches these techniques through Interactive and Virtual methods. The course is designed in such a way that children enjoy it a lot. During the course they undergo lot of brain development exercises, which enhances their mental abilities massively. Usually, the left-side of the brain is used by an everyday human being. 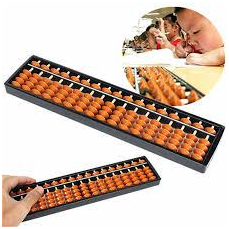 Science has proved that continuous use of abacus is able to develop the unused right-side of your brain. Think about how much you can achieve if you started to utilize more than what you are now. In young kids the brain is constantly building to form new connections in response to the stimulations received. This process uses the 3 senses (tactile, visual and auditory) to develop and balance the mental, physical, social interaction, emotional, personality and confidence of children. 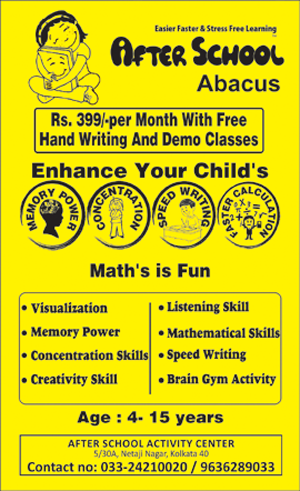 Regular practice of abacus, Brain gym and Speed writing helps children. Chief instructors are highly competent and technically qualified. They are trained by the expert councils from Malaysia to assist the Trainers / Instructors to exploit their intelligence and abilities to achieve optimum utilization of one’s potential. We strongly believe that there cannot be a compromise on the training methodology. We provide training to Franchisee’s Chief Instructor in a phased manner, which includes syllabus training, attitude tuning and skill development. 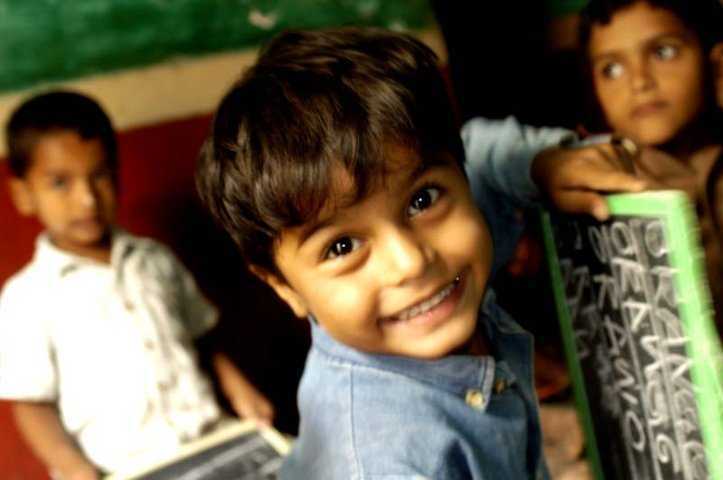 The students at our Franchisee centres will be certified from After School on completion of every GRADE. The course comprises of 10 grades. Each grade comprises of one term. Each term is of three months duration on an average with the total duration of 30 months. To make fundamentals stronger the first grade i.e. Grade 10 is for a period of 4 months.